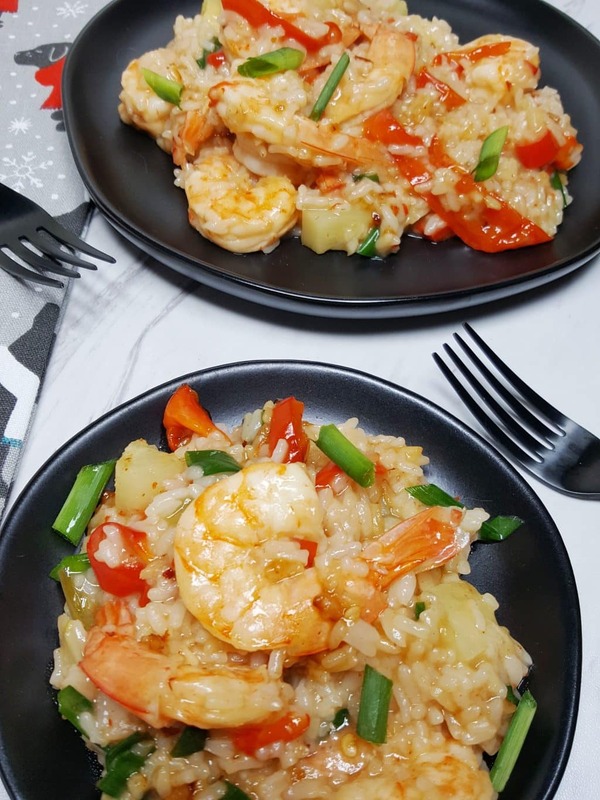 The beauty of this Pressure Cooker Sweet and Spicy Pineapple Shrimp recipe is that you can turn it into a Risotto or Rice dish, or, use Quinoa for a higher protein, lower carb meal! Sure, this recipe is so easy to make in a skillet on the stove, but the Instant Pot Pressure Cooker will save you from having to babysit your food. This is a dump and go meal. For a Rice dish, use Jasmine, Basmati or other White Rice. For a risotto-ish dish, use a Calrose Rice. I say risotto-ish, as it is not a true Ristotto, like my Pressure Cooker Best Wild Mushroom Risotto recipe. 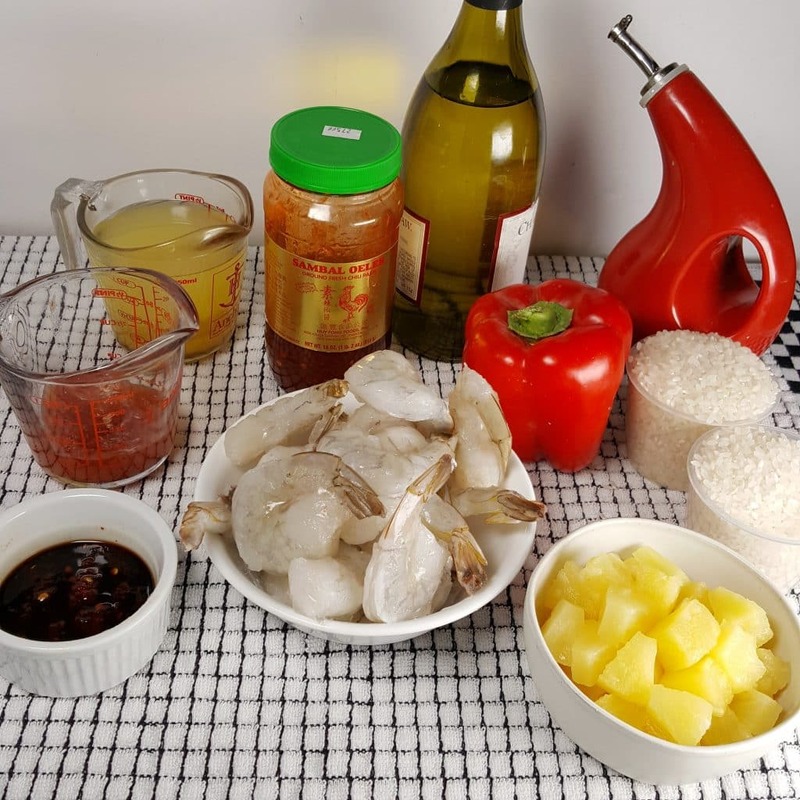 What Ingredients are in Sweet and Spicy Pineapple Shrimp? Broth can be substituted for the Dry White Wine, if desired. Make sure to always rinse the Rice, so that it runs clear. I used Calrose Rice in this recipe, which is starchier than other types of Rice and great for Sushi. 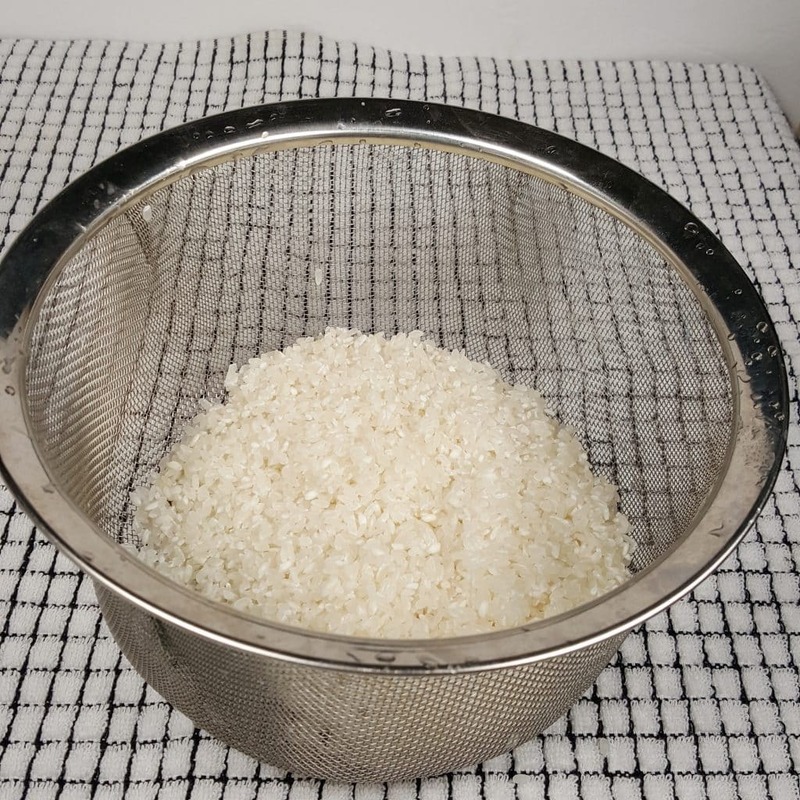 However, in this instance, take a Strainer Basket and rinse the Rice to remove some of the Starch, otherwise, it will become mushy. 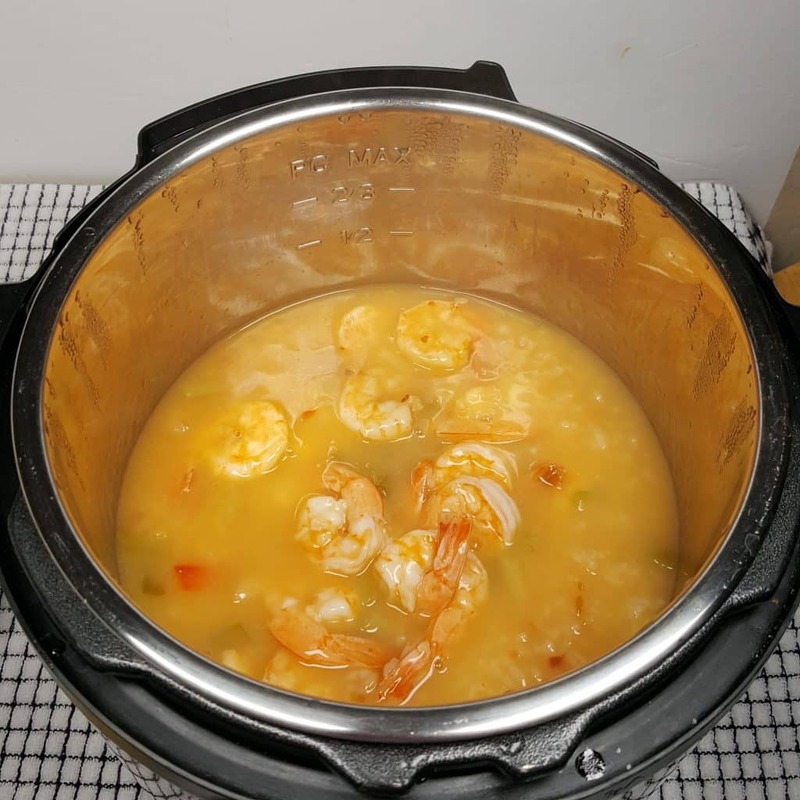 Another yummy Shrimp dish to try is my Pressure Cooker Seafood Corn Chowder. Everything goes into the Instant Pot or Pressure Cooker vcooking pot. Except for the Shrimp and the Pineapple Chunks. If you are using Quinoa, you will need to adjust the cooking time down to one minute. 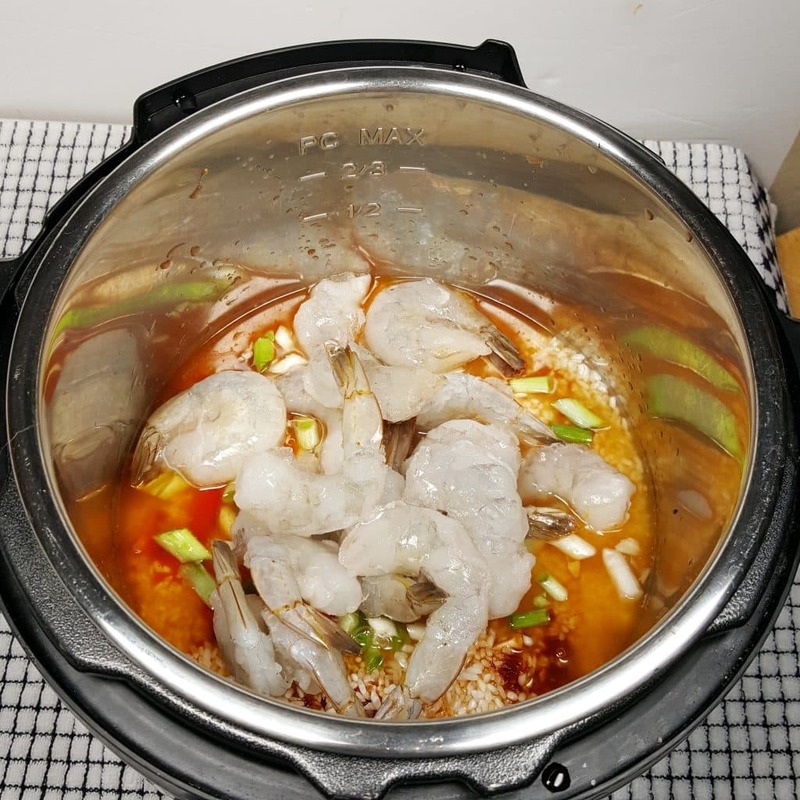 It is important in this recipe to add the Shrimp while they are still frozen. Costco sell bags of the Jumbo Shrimp for a pretty decent price. 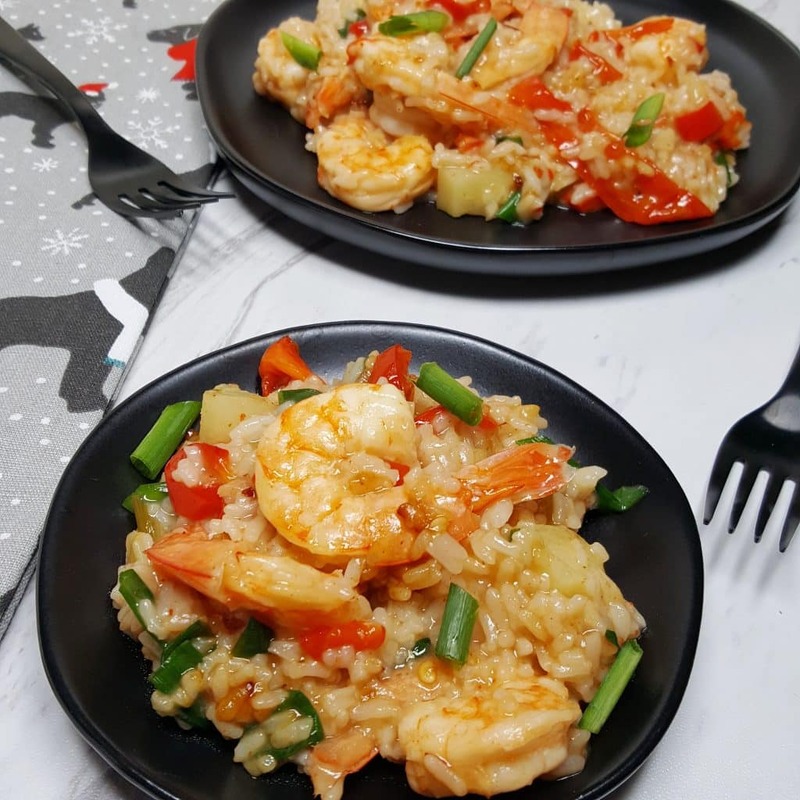 Give the Pressure Cooker Sweet and Spicy Pineapple Shrimp a good stir, so that the rest of the liquid gets absorbed by the Calrose Rice or Quinoa. You might need to use the Sauté or Browning feature, if the rice is not as soft as you like. Lastly, add in the Pineapple Chunks and the Scallions. I like to add in the Green part of the Scallions after pressure cooking. It adds nice texture and they wilt quickly. Mix in the Pineapple Chunks to warm. We all eat with our eyes and this dish does not disappoint. 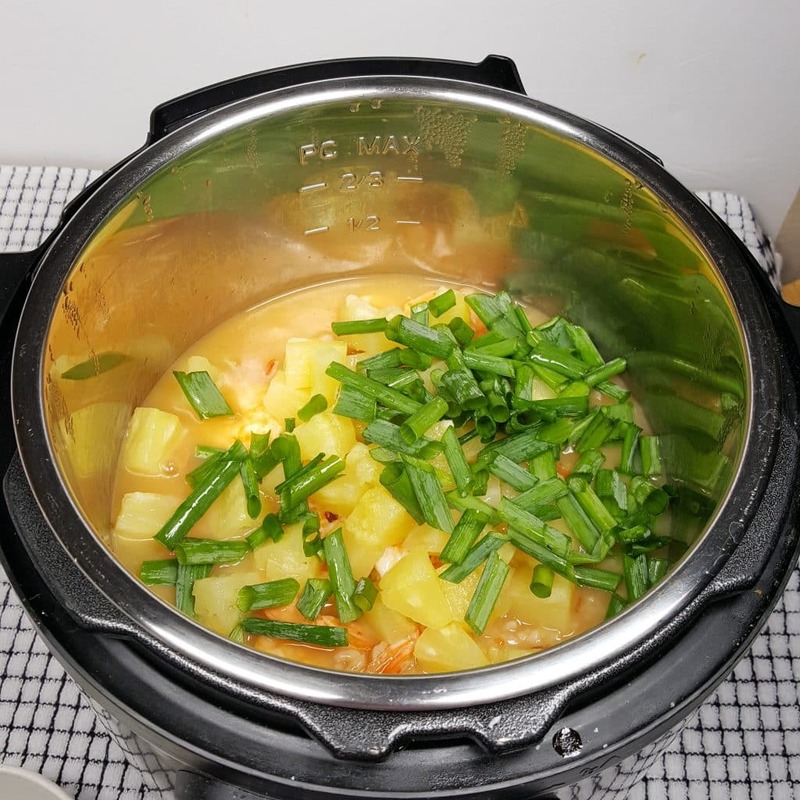 The bright Red, Yellow and Green makes the Pressure Cooker Sweet and Spicy Pineapple Shrimp look so yummy. 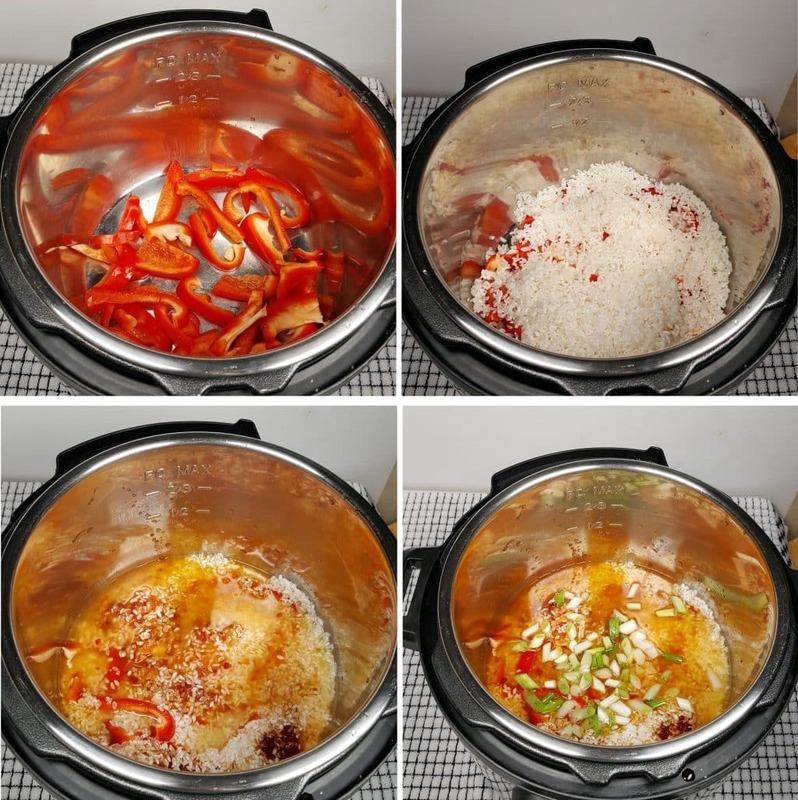 If you are a fan of sweet dishes, try my Pressure Cooker Pressure Cooker Chinese Take Out Sweet ‘N Sour Chicken or my Air Fryer Chinese Take Out Sweet ‘N Sour Pork recipes. Drain Juice from Pineapple and set Pineapple Chunks aside. Measure out 3/4 cup of Pineapple Juice. 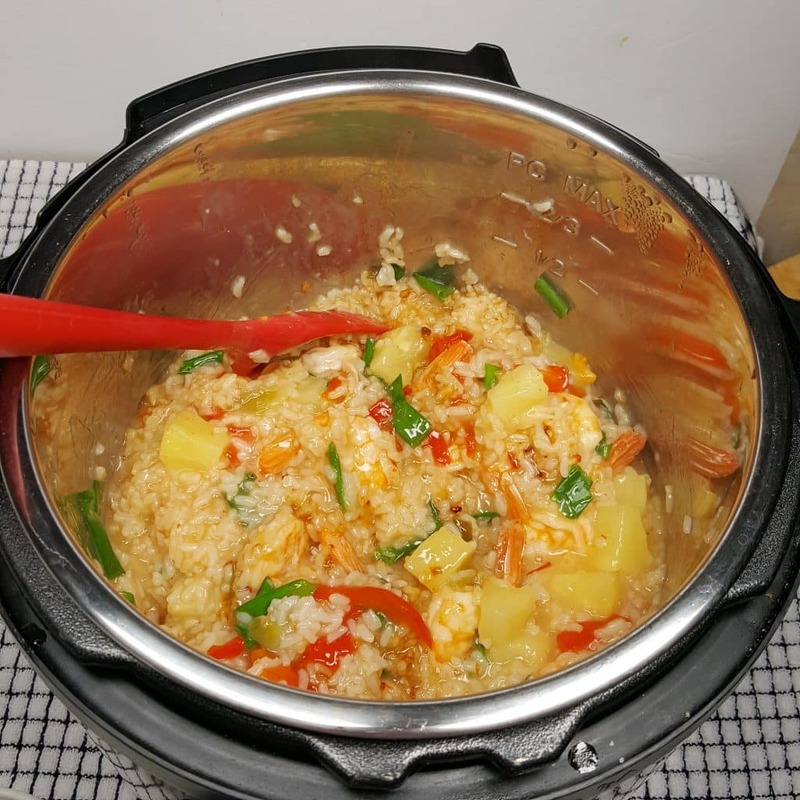 Add Red Bell Peppers, Pineapple Juice, Wine, Water, Chili Sauce, Soy Sauce, Sambal Oelek, Rice and chopped Scallions (the white part) to Pressure Cooker cooking pot. Place frozen Shrimp on top. Lock on Lid and close Pressure Valve. Cook on High Pressure for 2 minutes. When Beep sounds, wait 10 minutes and then open the pot. Add Pineapple Chunks and Scallion Greens and mix through. Shrimp must be frozen. If not, they will over cook. If you want to use fresh or thawed shrimp, add them after removing the lid and stir into hot rice to cook. Hi Jill… I love printing our and trying your recipes mostly with success. I am looking forward to your cookbook which will be out soon. I am wondering if you could say with your posts whether the recipe will be in your book? Then I wont have to print it out! My three ring binder is now packed with recipes (many of them yours) and I would like to downsize it. So should the rice be cooked before you put it in, or will it cook in that 2 minutes/10 minutes period? I made this with quinoa tonight. It is delicious, but I wonder a little about the quantities of rice or quinoa that are called for. 12oz of quinoa is a LOT! I used a generous cup of uncooked, and it was about the right amount. This is, believe it or not, the right amount of liquid (I had my doubts too) The sweetness of the pineapple does temper the spiciness of the sambal oleek and sauce, but there’s still quite a zip. I’d call this recipe a keeper! I love your recipes for the pressure cooker!!!! I’m wondering if I want to make the pineapple shrimp recipe doubled – does it affect the cooking time? If using quinoa, you say “you will need to adjust the cooking time down to one minute”. So the quinoa cooks in one minute? Or is it precooked, then added to everything else and cooked for one minute? 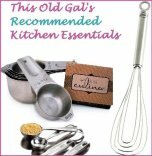 Love your new cookbook & all your recipes. Thanks so much for giving the Nutritional Info. I’m in kidney failure & have to count protein, calcium, sodium, & potassium in everything I eat. Your info makes that so easy for me. Thanks again!